I was at Whole Foods for ingredients to make cherry and oatmeal breads. Bread was to be a snack for the folks weatherizing ATO on Tufts campus. 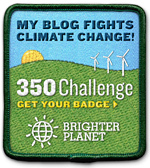 The weatherizing crew was a part of the global work party organized for the 350.org day of action on 10/10/10. All that thought of bread invoked an inescapable desire for cheese. I wandered over to the olive section where the stuff is often chopped into small cubes and offered as samples. No go. A nice man behind the bulk cheese bar kindly asked if I needed help. Before I knew it I had blurted, “I’m looking for a local, hard goat cheese.” The slender, bearded man shook his head slowly. I didn’t give up easily. I knew my sister had come home with something tasty with those qualities and the moldy richness had a hold of my nostrils. “Well, unless you’d be interested in this, ” he said about the artisan wedge of Twig Farm Tomme from West Cornwall, Vermont. Technically described as semi-hard, this cheese is creamy with a flat, nutty quality and sharp hint after taste. 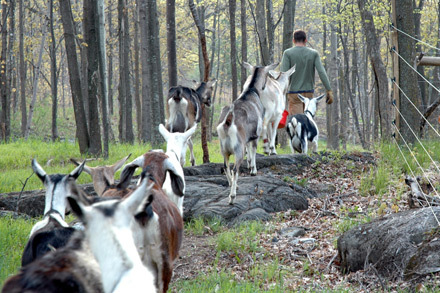 Hard goat cheeses are hard to produce locally because most goat farms are too small to justify the cost of the curing space. As he cut me a slice of the Tomme for a taste, the cheesemonger explained that this cheese would not have been possible without the generosity of Jasper Hill Farm, a hand-crafted cow cheese dairy in nearby Greensboro. 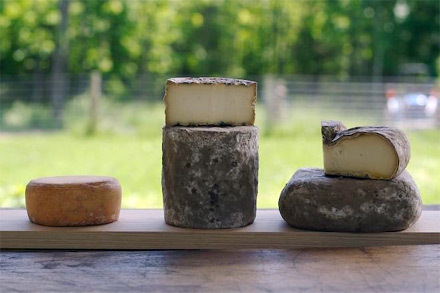 Jasper Hill Farm has underground cheese-aging cellars with lots of extra space to accommodate many small-scale cheese producers in the region. I had actually read about Jasper Hill Farm in The Town That Food Saved by Ben Hewitt and agreed with him that cooperation between small-scale producers like this is necessary to the development regional food systems. I knew I was going to buy the cheese as I warmed it to room temperature between my hands and laid the salty white slice on my tongue. Find Twig Farm cheeses at the Whole Foods in Medford and Formaggio Kitchen in Cambridge. I’m glad you found the cheese. FYI the tomme is distributed by Jasper Hill, but the aging is done here, on the farm. Thanks for your comment! Please feel free to share more about your cheese-making process. I’m sure my readers (and certainly I) would love to read more.